Kz Guitar Works has begun taking pre-orders for the new Kz One Adam Slack signature model! The price will be USD 3,500 (shipping included). The Kz One Adam Slack signature model features a portrait of Adam as well as a signed official certificate booklet. A hard case is included in the order. To place your pre-order, please fill out and send the order form from the link above. Once we have received the order form, A 1,000 US dollars invoice will be sent through PayPal or Square. Please choose your preferred payment method on the order form. Please pay the deposit (nonrefundable) within seven days to confirm your order. The order will be official once we have confirmed the deposit. The first guitars are scheduled for completion by March 2018. The guitars will be sent once we have confirmed your final payment. Shipping is now made FREE via EMS for overseas customers. The final payment can be paid securely through PayPal or Square. The Kz One Adam Slack signature model is a limited production model, with 30 being built. We will not accept any further orders once the 30th order is confirmed. 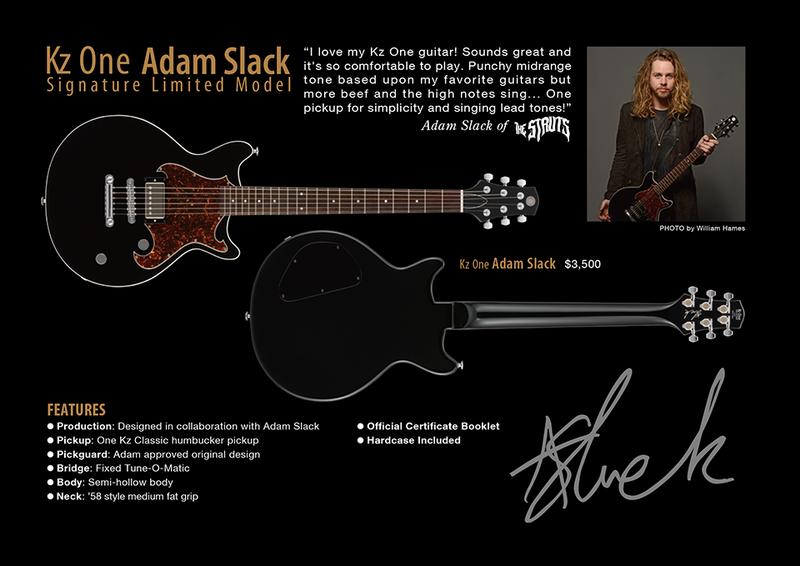 The Kz One Adam Slack signature model features a portrait of Adam as well as a signed official certificate booklet. A hard case is included in the order. Formed England by Singer-Songwriter Luke Spiller, Guitarist-Songwriter Adam Slack, Bassist Jed Elliott and Drummer Gethin Davies. The Struts have become one of the leading glam-rock acts to come out of the U.K since the turn of the 21st century. With a reputation as a phenomenal rock act, their presence in music is undeniable, enchanting audiences with a world-class stage show, larger than life personas, and of course, good old classic rock n’ roll. Guitarist Adam Slack had been playing in bands since his teens, and helped found the Struts along with lead singer Spiller. Since the foundation of the band, Slack has established himself as a critical part of The Struts’ sound, and continues to inspire fans of rock music around the world.